Why is nutrient-rich food important to people living with Parkinson’s? Because, no matter how perfect your medication regime, no matter how much, how often, and how hard you exercise, you need nourishing food for good health. With Parkinson’s, nutrition takes on an additional role in supporting the brain and nervous system, as well as the body. So let’s take a look at the foods that fortify the brain and the body. Whole grains, fresh vegetables and fruits, legumes. These provide complex carbohydrates, vitamins and minerals, antioxidants, and fibres. 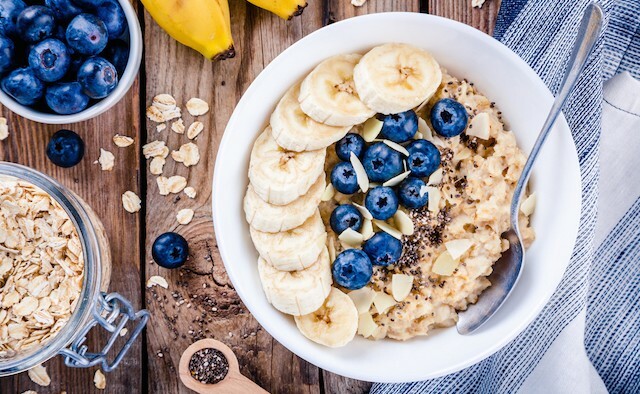 Whole barley, rye, and oats have all been found to improve aspects of our health, such as improved colon health, regular bowel movements, control of blood glucose and cholesterol, and strengthening the immune system. Blueberries may help prevent or slow neurodegeneration, and appear to boost memory. Apples and onions contain quercetin, a flavonoid and antioxidant, which may help protect against damage to DNA. Legumes and dry beans, split peas, lentils, chickpeas are rich in protein, fibres, and the B vitamins that are so important in Parkinson’s. Fish and seafood, meat, poultry, eggs, and dairy foods all contain vitamin B12, which isn’t found in plant-based foods. They also contain all nine essential amino acids. Fatty fish and seafood, and to a lesser extent, eggs, also have omega-3 fatty acids and vitamin D. These are especially important in Parkinson’s as the grey matter of the brain is largely made up of omega-3 fats, and deficiency is associated with dementia and depression. 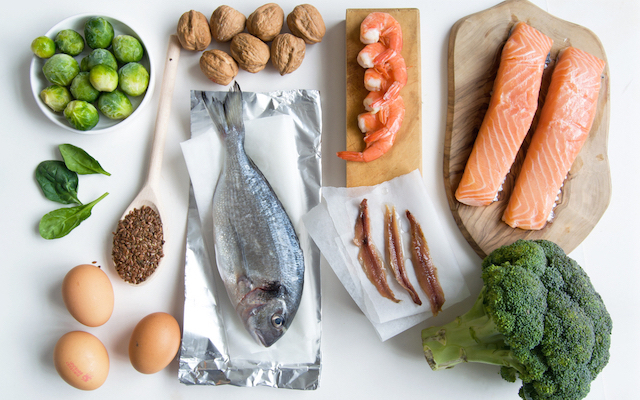 Omega-3 fats also support heart health. Fatty fish and eggs are among the few foods that naturally contain vitamin D. This includes the more powerful form called 25-hydroxyvitamin D, which is not found in supplements or fortified milk. Deficiency is associated with loss of muscle mass and bone density, falls, fractures, some cancers, irritable bowel syndrome, and cognitive decline. NOTE: Some people are very sensitive to the milk of cows, sheep, and goats. These contain an especially high ratio of the amino acids that compete with levodopa for absorption. If milk blocks levodopa absorption, choose a milk alternative such as almond, soy, or rice milk. Probiotic foods contain the living organisms such as friendly bacteria and yeasts that make up the microbiome. These are especially important for those with Parkinson’s. Research is increasingly finding a relationship between the brain, the gut, and the colony of cells in the gut called the microbiome. It appears that the microbiome may influence the onset and progression of Parkinson’s. Some speculate that Parkinson’s actually begins in the gut, due to poor gut health. Prebiotic foods contain fibres that humans can’t digest, but that serve as food and fuel for the probiotic organisms. NOTE: If you are using the drug rasagiline you should not eat aged and fermented foods, as they have high levels of tyramine. Such foods can cause hypertensive crisis. Yoghurt can be a good choice, as it’s safe for those using rasagiline. The more different strains of organisms it has, the better – look on the label to see which organisms it contains. Kefir is a fermented drink that may be made with milk, water, or coconut milk. It has more different strains of probiotic bacteria than yoghurt. If you are sensitive to milk protein, try water kefir or coconut milk kefir. Fermented pickles are made by immersing vegetables in a salt and water brine solution. They are not the same as pickles made with vinegar, which do not have probiotic properties. Fermented pickles must not be canned or heat-treated; heat will destroy the live organisms. Sauerkraut is fermented cabbage and is a good source of probiotic bacteria. Kimchi is a Korean version, and is spicier. Both must be unpasteurised, as heat will kill the organisms. Miso is fermented soybean paste. Whole wheat, oats, onions, leeks, garlic, asparagus, Jerusalem artichokes, lettuce, eggplant, sweet potatoes, bananas, tomatoes, cashews, peanuts, and legumes (dried beans, peas, lentils). Each of these foods has different types of indigestible fibres, known as prebiotics. Also high-quality dark chocolate is a prebiotic food. Prebiotics are used as food by the colony of friendly bacteria in our gut. Each prebiotic food supports different kinds of friendly bacteria, so if possible, eat a variety of these foods. One study found that subjects eating whole grains had an increase in one kind of the friendly gut bacteria, and a decrease in harmful bacteria. An animal study discovered that prebiotic foods improved sleep. So don’t skimp on fibre; keep those good microbes well-fed. Refined ingredients like white flour and refined sugar have been stripped of their nutrients and prebiotic fibres. Highly-processed foods, such as many canned soups, boxed macaroni and cheese, and frozen ready-to-eat meals contain refined ingredients and also have potentially harmful additives, such as emulsifiers, thickeners, artificial dyes and preservatives. We’ve long seen an association between agricultural use of herbicides, and increased incidence of Parkinson’s among farming communities. Now research is beginning to uncover possible causes. Some degenerative diseases appear linked to glyphosate, a common herbicide. Animal studies show that it may interfere with the normal working of the gut, which eventually damages motor neurons. ‘Brain‑gut‑microbiota axis in Parkinson’s disease’, Mulak A, Bonaz B. World J Gastroenterol. 2015 Oct 7; 21(37). ‘Does glyphosate acting as a glycine analogue contribute to ALS?’ (2017) J Bioinfo Proteomics Rev 3(1): 1‑ 21. Seneff S, Morley WA, Hadden MJ, Michener MC. Kathrynne Holden, MS, RD (retired) is the author of “Eat Well, Stay Well with Parkinson’s Disease”, “Cook Well, Stay Well with Parkinson’s Disease” and the NPF booklet ‘Nutrition Matters’. See her website, nutritionucanlivewith.com, for more Parkinson-related nutrition information. Read more: Parkinson’s and malnutrition: what are the risks and how do you prevent it?